Distinct Painting Company was built on integrity and driven to not only succeed but rather re-define the custom painting experience. Founded in late 2007 in Loveland, Colorado. After painting for several different companies, from industrial to new construction and restoration, Kane Robinson realized that his high standards, integrity, and morals were not being matched by those of his employers. We provide high-quality interior and exterior painting, as well as wood finishing that demonstrates our devotion to craftsmanship. We work on new construction and restoration projects alike. As a result, Distinct Painting Co. was started. 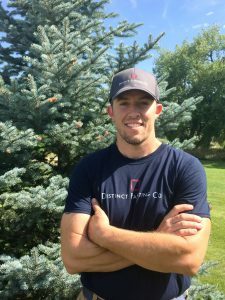 Since starting the company, Kane has applied his knowledge of custom craftsmanship along with his business degree he earned from Regis University to grow the company and thrive. When you hire DPC you are getting much more than a painting contractor. You are getting a team of courteous professionals who value your investment and will consistently strive to guarantee you 100% customer satisfaction. We pride ourselves on cleanliness and protecting your Colorado home during the project phase. By standing behind all of our work with our warranty, we have been able to build long-lasting relationships with our clients in Loveland, Fort Collins, Windsor and Northern Colorado clients, which has enabled us to grow steadily in the current economy. 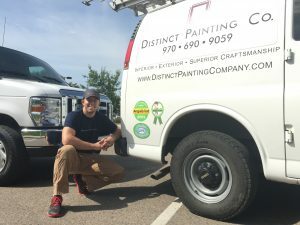 Distinct Painting Company is owned and operated by Kane Robinson. Kane has been in the painting and restoration industry and has been finishing and restoring residential and commercial properties since 2003. He founded the company in 2007.